We're very excited to kick off Summer in our little home of Sausalito with the return of the monthly Sausalito Art Walk. Our May featured artist is local talent Tracey Kessler. We asked Tracey a few questions to delve into her work, her story and what inspires her. Visit us on May 10th, 4-8 pm for artist's reception. Meet Tracey, view her work, peruse jewels and join us for some bubbly and treats! We will also be offering 10% off all jewels during Art Walk. 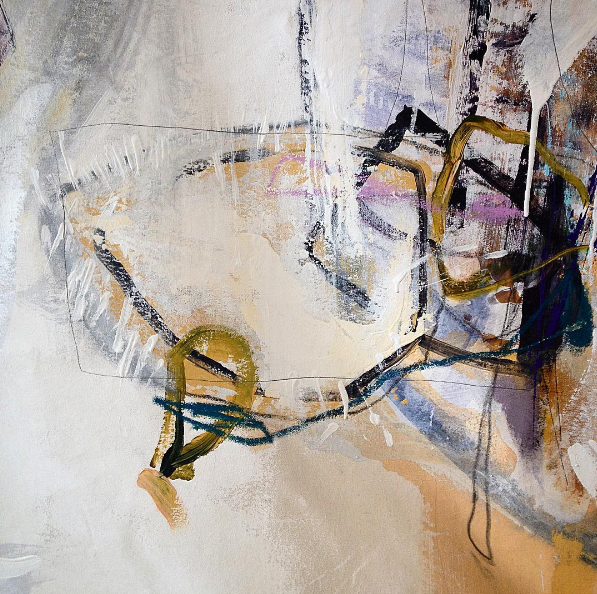 "In my work, layered abstractions are born and transformed by nature's elements of wind, rain, sunlight and time. I explore the circumstances of life through a diversity of media, textures and gestures, which imbue my compositions with vitality and a sense of motion. My work mediates between turbulence and joy. As layers of material are melded and molded by hand and time, the beauty of our daily path is revealed." 1. Can you tell us a little bit about your background in design? Without having that background, do you think you would've found painting? Or was one necessary to lead to the next? My background is in architecture, interior design and conservation. My first job in the field was with Gwathmey Siegel in New York, one of the New York Five Architects. This started to develop my eye for modern design and looking at art collections. I painted all through college at FIT including working on and restoring 17th century paintings in Spain. I started to show in the early '90s in New York but then my design career took precedence. It wasn't until 2010 that I started painting full time again after returning to the Bay Area and living in Marin. I don't think a design or art background is necessary if you are a talented or a gifted painter. I've seen plenty of people who have advanced greatly after practice, practice, practice and there are others who are just naturally gifted. I'm somewhere in between there. My work is often mixed-media abstract but on occasion some series are more realistic or conceptual. 2. What is it about the Bay Area that lured you in? How do you find that it guides your creative work? My sister had moved here after college in 1997 and I came for a visit. I had already been in Manhattan for about 10 years and was craving something new, different and a calmer pace. Though I had always visited the Los Angeles area, I didn't know what the Bay Area was about or that San Francisco was such a great city. I took the leap after being in Philadelphia for a few years and it completely changed my life. Then after living in San Francisco for 10 years and having an Interior Design firm, I accidentally found myself in Marin (with the exception of a return to New York for two years) and the various natural elements seeped into my work. I can see the elements of the fog, mountains, pacific ocean and open spaces working into my paintings through textures, colors, lines and palettes. 3. 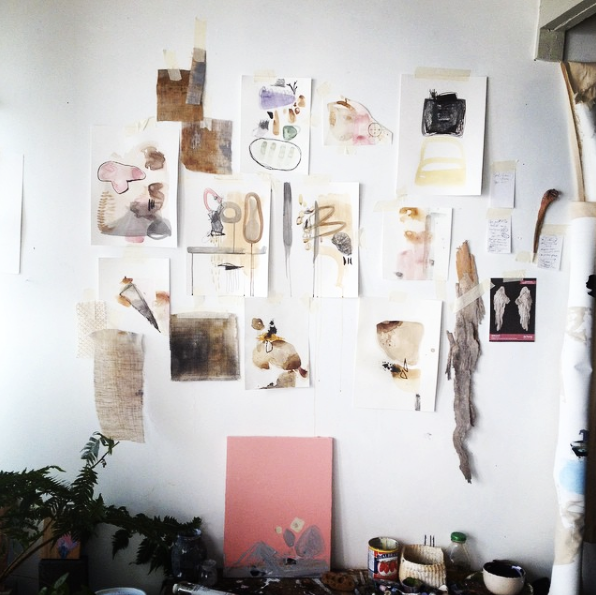 We used your studio space for a photo shoot last year and found it to be a very beautiful and interesting space! How important do you think it is for an artist or designer to have a creative space that is visually inspiring? Extremely important for the creative space to be your quiet sanctuary, think tank and private world. Mine is fairly orderly and I'm usually working on two or three paintings at a time. I'm in a compound on Gate 5 Road that has a ceramic co-op, three other painters, a woodshop and a jewelry designer. We also have about 5 dogs at any given time running about. We are just like the young tech companies but in an outdoor environment with beautiful gardens and vistas around us. 4. I've noticed a shift of color palette in your most recent work. Is this something that evolves naturally over time or do you make a conscious decision to alter how you are approaching your fine art? I think my palettes shift slightly over time very subtley. It's mostly earthy palettes and tones with a pop of color here and there. I've noticed pink and light blue so much in my work since moving to Sausalito and think it's due to the sunsets. The dusk scenes with the marina or Mt. Tam in the background are postcard worthy for sure. It sounds so cliche but this area really does seep into the subconscious mind. 5. If you could travel anywhere in the world, leaving tomorrow, where would you go? 6. We love the quirky little town of Sausalito that both you and I call home. Do you have a favorite beach/activity/restaurant/etc that curious visitors should add to their list of things to do while visiting? I take the dog out to Rodeo Beach in the Marin Headlands which has incredible views and a great hike. Tennessee Valley trail is another wonderful hike. I enjoy the mussels at Le Garage a lot and since I designed the light fixtures at F3 during my interior design days, I tend to stop in there for a wine and the cheese plate. Their brunch is tasty as well. The eggs benedict with a fried green tomato is to die for! The lobster bisque at Seafood Peddler is another favorite and having a prosecco on the back terrace of the Barrel House is pretty spectacular for views. I've also starting working with a San Francisco company called If only, which offers extraordinary experiences to do alone or in a group. I so looking forward to meeting more travelers coming to the Bay Area. 7. Can you tell us about the work you'll be showing for the art walk. These are mixed-media and oil paintings that I've worked on since moving to Sausalito in 2015. You can see the various shapes that I believe are Mt. Tam, tides, rocks, various elements in and around the houseboats and my softer color palate. I tend to built up the canvas by adding and subtracting layers of paint over a period of time until the painting starts to visualize and I can see the composition come through. This is the surprising dance while painting abstractly. It can be not-working and going horribly wrong and then with the next layer of paint-- an incredible surprise of its "just right" seems to happen! It's deciding when to stop and not take a painting too far that is the challenge. Thank you, Tracey! If you're unable to make it to the show opening on May 10th, Tracey's work will be on display until June 13th.